"Cellular Zeolite - Nature's Detoxifier"
Cellular zeolite (or simply zeolite) is a natural mineral that can be found in volcanic ash. In a process known as 'devitrification', the mineral is formed over millions of years when lava remains in contact with fresh or salt water. It's unique crystalline structure and honeycomb framework (seen to the right) of cavities and channels (like cages) works at the cellular level by trapping toxins and heavy metals. Because it is one of the few negatively charged minerals in nature, cellular zeolite acts like a magnet and draws toxins into its cages. The toxins are stored in these cages until the zeolite is completely removed from the body after around 7 hours. Powdered forms of cellular zeolite have been used as traditional remedies around the world to promote overall health and well being. As more and more people have experienced its life-changing benefits, the story of the "volcanic rocks" has continued to thrive from generation-to- generation. Cellular zeolite is used by tens of thousands of people everyday to reach unimagined levels of health and vitality because it provides a way for you to detoxify efficiently, quickly, and most importantly, safely. In fact, no other detoxifier can come close to the efficiency and safety of cellular zeolite when it is manufactured properly. Powdered forms have a downside - the zeolite molecule has already drawn toxins to itself from nature, and the substance is not manufactured to remove these. With a liquid zeolite product, the molecule is heated up in a special process that cleans the cages and lengthens the chemical bonds. Therefore, not only are all the existing toxins removed, but the cellular zeolite is now up to 20x more active than in the powered forms. 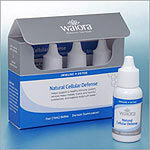 "The most important supplement you'll ever take"
Natural Cellular Defense™ by Waiora is a brand new health supplement that uses a unique manufacturing process that not only removes all impurities from the starting cellular zeolite mineral and increases the potency, but "activates" the free-floating cages or boxes so that they are preloaded with magnesium, calcium, and phosphorous ions. These ions not only exchange easily with heavy metals, but are also healthy for the body. The supplement is so efficient that just 100 drops has the equivalent toxin absorption area of nearly 8m�! There is no other health supplement on the market that is as pure or as effective at detoxifying the body. In fact, this supplement is so safe that it has been taken by pregnant women and babies. Natural Cellular Defense™ has been clinically formulated to help support a healthy immune system, remove heavy metals and toxins, and balance your body�s pH levels. Natural Cellular Defense™ took fourteen years of extensive development and testing to become the powerful supplement that it is today. The manufacturing process uses the same top grade zeolite used by NASA as a starting material - sourced from mines in Montana and Texas (known for their zeolite purity) before the rock is put through the liquidation, purification, and activation process. "I passionately feel the zeolite product has so much to offer basically the entire population, and I feel this is almost a crusade to educate the public about the benefits of this one product..."
1) Extremely Safe and Non-toxic: Cellular zeolite is completely natural, 100% non-toxic (it's on the FDA's General Recognized As Safe list), and is totally eliminated from the body after 5 to 7 hours. Zeolite has been safely used by pregnant women, nursing mothers, and small children. It's also safe to take with most medications, but always check with your doctor first. 2) Remove Heavy Metals and Toxins From Your Body: Cellular zeolite has the perfect molecular structure for capturing and removing heavy metals from the body including mercury, cadmium, lead, arsenic, aluminum, tin, and excess iron. It also removes radioactive metals like cesium and Strontium-90. The process begins immediately and takes approximately 4 to 6 weeks. 3) Support Your Immune System: Cellular zeolite does not stimulate the immune system, but allows it to function optimally by removing toxins, viruses, yeasts, bacteria, and fungi which can depress immune function and interfere with hormones. Many people report feeling increased energy, clarity, and vitality. 4) Buffer Your Body's pH to a Healthy Alkalinity: A slightly alkaline body pH (7.35 - 7.45) is essential for great health and optimal immune function. Cellular zeolite attracts and then buffers excess protons which cause acidity, thus helping balance your body's pH levels. 5) Extremely Easy and Pleasant to Take: Most serious detox solutions are tough to take (many are injected, given as an enema, or must be taken away from meals), taste unpleasant, and can leave a person feeling drained because they indiscriminately remove healthy metal ions as well. By contrast, Natural Cellular Defense™ is a small bottle of tasteless liquid that can be taken with or without food and removes only unhealthy ions. It's also completely safe for long-term use. "Where cures are seldom, an ounce of prevention is worth years of an otherwise shortened life � vs � a ton of ineffective and miserable treatment. Since most cancers are caused by toxins we either ingest or inhale, prevention means ridding our bodies of these toxins. I will be using liquid zeolite and I will be recommending this to every member of my family and every patient I see." "The science and research behind the natural zeolite product demonstrates its ability to safely detoxify the body of environmental toxins and potential carcinogens. We now know that many of these illnesses that we are face with as we age are strongly impacted by these chemical toxins. On the basis of the extensive research concerning this product, I'm impressed with its ability to support a healthy immune function, balance the body's pH, detoxify and/or chelate heavy metals, toxins and other known illness-causing agents. This all natural zeolite product could be the most important and significant breakthrough in detoxification ever. By detoxifying the body of these harmful substances, we can help reduce the risk of minor illnesses and many serious illnesses as well. This is a product that my family and I use daily and I believe that everyone should be using." "I take this natural zeolite product, and I feel that everyone living in the industrial world should be taking it on a regular basis. This product is very different from supplements that add to well-being, but are not essential. Zeolite is simple, elegant, extraordinary, and vital for healthy living in today's toxic world." The real question is... what would happen if you could free your mind and body of toxins, unleash the true natural healing powers of your body, and boost your health to quite possibly the highest level it's ever been? What would that feel like? There's only one way to find out. If you're ready to try this amazing supplement today, click the button below to find out how to order cellular zeolite.